A very good quality steel pulley roller. Zinc plated for smooth & polished finish. Rolls very smoothly compared to low-quality rollers. Select 1.5" or 2" wheel above. 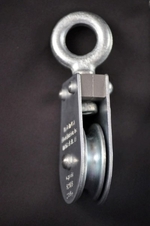 1.5" is adequate for shorter applications such as 10-11 ft or less. Taller applications have less leverage, and require more "help" from the wheel. A larger diameter wheel makes sliding easier. 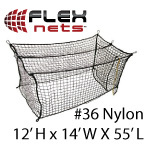 Essential when curtaining your nets on cable lines. The Swivel Eye makes traversing easier, allowing for margin of error when pulling curtain. When Fixed Eyes are used, the curtains must be pulled in a perfectly straight line to avoid binding. TIP: Install majority of wheels where most of downward tension will be placed and the connections will slide the greatest distance, e.g. opposite of the end the net will be collapsed against. 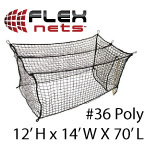 The cable fits into the groove on the wheel, which allows your net to slide much easier. The more wheels used the easier mobility will be, but typically 10-15 on each line on the end the nets will be pushed from is adequate. Upgrading to the 2" wheel will improve mobility. For frequent sliding & higher elevations,we recommend the Premium Steel Roller - see Related Items Tab above. These are a must have for any net installation. It makes it so easy for opening and closing the cage for use!